How much does this service cost? Is it secure? What is Merchants Bank of Alabama Mobile Banking? How will I know when my deposit has been received & processed? What is Merchants Bank of Alabama Text Banking? 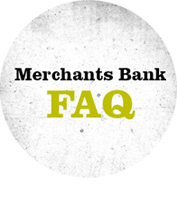 What is Merchants Bank of Alabama shortcode? CanI use both Text Banking and Mobile Banking on my phone? How do I subscribe to Mobile Alerts? What happens if I don’t allow the device to ‘Remember Me’? There is currently no charge associated with the service. However, there may be charges associated with text messaging and data usage on your device. Check with your wireless provider for more information. We support most of the popular US wireless phone carriers, including AT&T, Sprint, T-Mobile, and Verizon. If your carrier is not listed when you enroll, select ‘Other’ and try the Mobile Web option, or check back later, as new carriers will be added over time. Activation Code – After you enroll a device, you will receive an activation code which will be required to begin using Text or Mobile Banking on your device. We recommend you print your activation code and installation instructions for easy reference during installation. Device Enrollment – If enabled, you may enroll via the device. Please refer to the Device Enrollment Section within these FAQs. Note: Text Banking enrollment requires following the Activation Code method. Activation Code – Sign in to Online Banking on your computer and choose the Mobile Banking option. Enroll your mobile device and follow the activation instructions. Device Enrollment – If enabled, you may enroll via the device. Please refer to the Device Enrollment Section within these FAQs. At the time of activation, a “cookie” is stored on your device which allows the Mobile Banking system to remember that you activated. The cookie is only visible by the Mobile Banking system and does not contain personal information. Some devices may require you to enable cookies or periodically erase them, requiring reactivation. If you are experiencing this issue, check your settings to ensure that cookies are enabled. If cookies are enabled and the issue persists, please contact your mobile network carrier for cookie support information on your device. If you would like to reactivate and text banking is enabled on your device, text R or RECOVER to 49794. If Merchants Bank of Alabama supports enrollment on your mobile device, you will not need to provide an activation code. However, you may be asked to enroll again due to issues with cookies. Mobile Banking is supported on most devices with a mobile web browser that supports cookies. In addition, the mobile application is available on many smartphones including: iPhone and Android. Both mobile web and mobile applications may be found by entering the mobile web URL (http://m.merchantsbankal.com/) in your device’s browser. Merchants Bank Mobile Deposit allows you to quickly and easily deposit checks to any of your Merchants Bank savings or checking accounts using the camera on your smartphone. Using the Merchants Bank mobile app, log in to your mobile account and select ‘Check Deposit’ from the menu. Then follow the step by step instructions. Customers who have a checking or savings account are eligible for Mobile Deposit service. The most recent version of the Merchants Bank App for your iPhone or Android smartphone. Checks made payable to you and drawn on a bank in the United States. We are unable to accept money orders, cashier’s checks, traveler’s checks or tax refund checks. Yes, during the deposit process you will be required to photograph the front and back of your check. You will receive a notification by e-mail when your deposit has been received. When your deposit has been processed, you will receive a second e-mail notification on the status of your deposit. This e-mail will indicate if the deposit was approved or declined for processing. If declined, a reason will be provided. Mobile deposits made before 4:00 pm CST will typically be available the next business day. Processing days for Mobile Deposit are Monday-Friday, with the exception of federal holidays. Deposits submitted on Saturday, Sunday, federal holidays & after 4:00 pm CST Monday-Friday, are available the second business day. Please retain your check in a secure location until it is reflected in your account balance and then destroy the item. Please contact the Customer Service Department at 256-734-8110 or visit any of our offices. You must first enroll in the SMS/Text Banking in order to subscribe for Mobile Alerts. After registering for this mode, go to your Internet (Online) Banking alert page. From here you will be able to subscribe to the alerts you wish to receive on your mobile device. Device enrollment validates the user’s banking relationship by asking the user to provide their credentials and mobile telephone number. Yes, if a mobile-only enrollment is not offered. Your User ID, password and mobile telephone number will be used to enroll you in Mobile Banking. If you are not enrolled in Internet (Online) Banking, please proceed to the institution’s website to register for Internet (Online) Banking first. Users may enroll for, both, the web/browser-based version of Mobile Banking as well as the downloadable applications, if supported. SMS/Text for Mobile Banking must be enrolled from the Mobile Banking Center using a personal computer. Click on the “Activate Now” link for SMS and follow the instructions presented on the screen. On applications that allow saving the User ID, you may save your User ID by selecting “On” when prompted. For enhanced security, the User ID will then be presented in the future in a masked format, hiding some of the characters. You may also remove the User ID, at a later time, by simply changing the prompt to “Off”. The ‘Remember Me’ prompt enables your device to recall your Mobile Banking registration so that you are not presented with challenge questions every time you log in. If you select “Off” for the prompt, you will be required to reply to the challenge questions each time you log in to Mobile Banking. Mobile BillPay allows you to pay bills online, saving you time, envelopes and stamps. It is an optional service on your Internet (Online) Banking account. You may pay bills using your mobile device while on-the-go, anytime, anywhere. To pay a bill, select the “BillPay” option from the main menu, then select “Pay Bill”. A simple flow chart guides you through choosing the payee, the payment account, send or due date and amount. You can even enter an optional memo. Only you may create and authorize a payment. Depending on the Payee’s capabilities, payments are issued via paper checks or electronically. Both payment forms include remittance information to ensure your Payee may credit your account. For more information about payment scheduling and delivery, please visit the Help section on your Online Banking website. To cancel a payment, select the “BillPay” option from the main menu, then select “Scheduled”. The system will respond with a list of payments currently scheduled and unpaid. Choose, from this list, the payment you wish to cancel. The system will display the payment details. From this screen, select “Cancel Payment”. The system will ask you to confirm that you wish to cancel the payment. To view previously paid bills, select the “BillPay” option from the main menu and then select “Recent”. Your display will refresh with a list of completed bill payments in a summary format. Select an item to see the payment’s details. If you have an issue with a bill or a specific item on the bill, contact the Payee directly. Remember, you may pay whatever amount you desire in BillPay while you are disputing any item. At the time of activation a “cookie” is stored on your device which allows the Mobile Banking system to remember that you activated. The cookie is only visible by the Mobile Banking system and does not contain personal information. Some devices may require you to enable cookies or periodically erase them, requiring reactivation. If you are experiencing this issue, check your settings to ensure that cookies are enabled. If cookies are enabled and the issue persists, please contact your mobile network carrier or device manufacturer for cookie support information. If you would like to reactivate, text R or RECOVER to 49794. If Merchants Bank of Alabama supports enrollment on your mobile device, you will not need to provide an activation code. However, you may be asked to enroll again due to issues with cookies.